TJ's Gardens is a group of holistic and organic gardeners who cultivate quality cannabis for the community. TJ’s is named after its founders: Travis MacKenzie and James Orpeza. Together, these two friends and business partners have built one of the largest stable of award-winning genetics. They’ve also been recognized as one of the most decorated cannabis grows in the country. Their dedication to creating something positive and progressive is evident in every offering. Travis got his start in the industry as a labor of love for his wife, Cham, who suffered from debilitating migraines after surviving an accident that resulted in a brain injury. Cham’s neurologist strongly suggested she try medical cannabis, and so Travis started growing a few plants. The cannabis he produced proved effective for Cham’s pain management and stopped most headaches before they became excruciating. Thanks to treatments that consisted solely of cannabis, the frequency of Cham’s migraines was reduced by 90 percent. After seeing these positive results and benefits, Travis became motivated to help others and soon pursued a larger location so he could grow for more patients. He was inspired to aid and educate his community in a way that would allow him to have the most impact. On his journey to get to the next level, he crossed paths with James. Prior to meeting Travis, James had also been growing medical cannabis for patients for many years. James was involved in numerous smaller partnerships with other grow-ops that sought out his consultation, implementation, and grow expertise. Through his very first patient’s experience with cannabis, James quickly understood the cannabis plant had much more to offer than a good high. He realized that his growing talents could be applied for a bigger purpose, on a much larger scale. When James started collaborating with Travis, he had more than 25 years of indoor and outdoor growing experience under his belt. James was responsible for bringing a “beyond organic” approach to growing in the gardens. This approach has become a foundation for all of TJ’s practices. The knowledge and innovative techniques he brought to the table were pivotal in turning TJ’s great flowers into truly amazing products. Together, Travis and James have proven to be an unstoppable force. 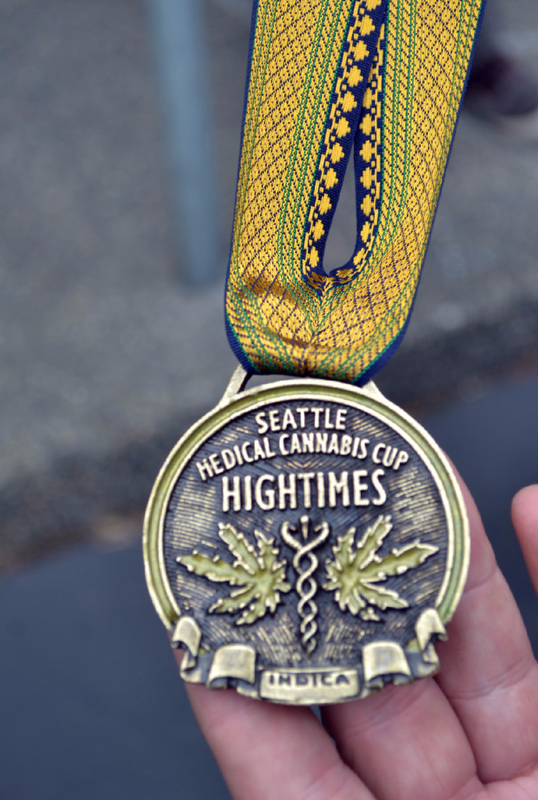 Along the way, TJ’s has won 30+ awards at High Times Cannabis Cup events, Dope Cup events, NW Cannabis Classic competitions, and many other notable cannabis competitions in the Pacific Northwest. The company was also recognized by High Times for producing “The Best Tasting Buds on Earth” (TJ’s Durban Poison strain) two years in a row. Additionally, TJ’s has a prized CBD strain that’s won numerous awards and is the magic behind the oils that the company donates to 100+ qualifying families via The Forrest Initiative. Travis and James spend plenty of time in their gardens personally, but they’re proud to have a dedicated crew that helps them tend to their plants—from cuttings to trimmings. The team treats the gardens with the utmost respect and honor. TJ’s truly is a labor of love, and that key ingredient is evident in both the company’s staff and flowers. Travis is co-owner and co-president of TJ’s Organics in Washington and TJ’s Gardens in Oregon. He currently oversees all retail operations in Oregon and assists with grow operations in Washington. Travis is also responsible for the extraction department, as well as day-to-day operations. Travis has been growing cannabis for more than 10 years, and his love for the plant is undeniable—just like his passion for helping others. He’s driven by his desire to find a more natural approach to wellness. His wife, Cham, has always been the leading reason for his interest in the industry. Travis previously served in the U.S. Coast Guard as an electronics technician. He has also worked as a low-voltage electrician, focusing on PBX, network, and security systems installation and repair. His company specialized in data systems wiring and installations for businesses throughout Oregon. Travis’s background working with logic-based systems and analytics has helped TJ’s become one of the first cannabis companies to recognize the value of micro-dosing cannabinoids for health and wellness. Travis enjoys spending time with his family. He is a father to three wonderful adult children who pursue their dreams and passions with vigor. Travis is known for forging friendships in the community where he lives and works, and is a highly respected businessman and Eugene resident. He enjoys exploring the outdoors and learning new things. James Orpeza is co-owner and co-president of TJ’s Organics in Washington and TJ’s Gardens in Oregon. James currently oversees day-to-day growing operations in both states. He is also responsible for all future expansions of the company’s grow projects. As a master grower, he works alongside gardeners and processors in all locations. James has been meticulously growing cannabis for more than 25 years. His passion for growing plants in general started at a young age, when he learned a lot from his father about conserving precious resources. James has always had a green thumb, and he’s a natural leader. His persistence and drive to grow naturally and sustainably is unparalleled. He continuously educates himself regarding what’s best for people and the environment. James has a diverse professional background that illustrates his commitment to growth and progress on many fronts. He served as a fire systems service manager and owned his own specialty construction company. James even played Poker professionally for a few years. His passion and talent for growing top-notch cannabis led him to be successful in today’s cannabis industry. James strives to help his employees thrive and excel at their jobs. He’s proactive about keeping the company involved with and connected to the local community. When he isn’t working (which is a rare occurrence), James enjoys home life with his supportive partner, Tilly, and their dog and two cats. His hobbies include Jiu-Jitsu, driving his Audi, traveling, snowboarding, live music, camping, hiking, playing an occasional Xbox game, being an avid foodie, and all things Pacific Northwest. Every plant deserves to be grown to its full genetic potential. Every patient deserves to have access to and use the plant most helpful to them for their specific issue. TJ’s Gardens provides cannabis to people suffering from Epilepsy. TJ’s Gardens is proud to introduce The Forrest Initiative, a center dedicated to serving the needs of under-resourced families in our community. This important program was originally founded in 2014 as the TJ’s Kids and Families Program, but it has since evolved into an organization with a much broader mission. The Forrest Initiative’s mission is to help families source CBD oil at no cost for their children in dire need of this life changing oil. Cannabidiol (aka CBD) oil is a natural, non-psychoactive product derived from cannabis plants. Because there is no psychoactive quality that makes you feel “high,” this product is given to people suffering from seizures, anxiety, insomnia, neuropathic pain, ulcers, and other medical symptoms. The founders of TJ’s Gardens, along with a few parents looking for alternative medicine for their children, realized that there was a substantial need for affordable pediatric solutions within the cannabis industry. Prices of CBD oil, especially from high quality sources, have recently skyrocketed in some areas within the past few years. In response, TJ's Gardens unanimously voted to offer their medicinal CBD oil at no cost to children with their medical marijuana cards. Although the program was quite small to begin with, it has now grown to include over 100 families as more parents are seeking affordable alternatives for their children. The Initiative originally began with one child, Forrest, hence the namesake. Forrest started on a low dose regime of this non-psychoactive cannabis oil to treat his seizures after his pharmaceutical medication did not help him. Forrest was suffering from extremely negative side effects as a result of the pharmaceutical medication, so his parents decided to seek a different route. Forrest has now been completely seizure free for the first 6 months since his original dose of CBD oil, and he gets to experience a significantly improved quality of life. Therefore, we believe that this special gift needs to be shared with other families in need of this oil. The Forrest Initiative continues to greatly improve the lives of both children and families across Oregon by constantly striving to grow the program to help as many families in our community as we can. Please contact TJ’s Gardens today about how you can contribute to this special program. Our genetic lineup is constantly growing, offering patients a large number of treatment options for medicinal and recreational needs. All of our flower and products are upheld to the highest quality standard and are always lab tested. TJ's Gardens has won multiple awards for quality and potency including 1st place in the High Times Cannabis Cup Seattle as well as being People's Choice and Judge's Choice at the Dope Cup Awards. Providing a high quality weed experience is what we do! The TJ's Gardens family is home to seventeen of the Pacific Northwest's top medical and recreational marijuana dispensaries, and counting. Want to join our team at the best dispensaries in the Pacific Northwest?